The TipBet mobile app for Android is well known for its practical yet stylish layout that allows users to understand and work their way around the app easily. It also has a number of features that you will not find in most other betting apps. The TipBet mobile app lets their users bet live, use the instant bet feature and even play through downloadable casino client. Extremely handy, the app lets users check on their bets and live track events from wherever they are. As the TipBet app is new, you shouldn’t be surprised if you find new features after an update. Downloading the TipBet app for Android is a non-issue. Quick and simple, you will be able to use the app moments after downloading it. While the app is formatted like any other Android app, it isn’t available in the Play Store. For those unaware how to download the app or where to download it from, all you need to do is follow our step-by-step instructions which will allow you to do so without a hitch. Open your phone’s Settings section and find the ‘Security’ option. In doing so, look for an option that says ‘Unknown Sources/Applications’. Click on it to enable the setting. Doing so will allow you to download applications from places that aren’t the Play Store. After you have done as much, through your phone’s browser visit www.TipBet.com. On the site, you will find an option on the homepage that says ‘download application’. Select that option and wait for the app to finish downloading. Once it has done as much, you can start the installation process by clicking it. After this is done, you can launch the app by clicking the home button that will automatically appear on your phone. After all of this, don’t forget to disable the ‘Unknown Sources’ setting. The TipBet app for iPhone and iPad devices, like the one for Android, is straightforward to use. The layout of the app has been designed in such a manner that even those completely new to using apps won’t have difficulty using it. The TipBet app for iPhone and iPad devices doesn’t lack any of the features or choices offered by Android or the mobile site. Even the same bonuses and promotions are made available on the app. Visit the Apple iTunes Store on your phone. Type TipBet in the search engine to look for the app. After finding the app, choose it and then click the download button. Wait for the app to download and install it. As soon as it has finished the installation process you can start using the app. It is fair to say that people who use the TipBet app for sports betting receive more perks than anyone else. The TipBet app has an unimaginable amount of options that range from mainstream sports such as football, basketball, baseball, cricket, American football to less popular sports such as futsal, darts, snooker and table tennis. Even boxing and motorsports aficionados can get in on the action. People betting on sports even receive live updates on many sporting events and can use TipBet to bet live on events. You can even select the one event and receive constant updates on that as well. However, what will really catch the user’s attention is the sheer number of offers and bonuses available to sports bettors. Some of the offers for TipBet mobile sports betters include a 100% bonus, a 200% bonus, Free bet, Cash out and even refunds on losing bets. Amazing, isn’t it? The mobile site for TipBet has also been designed for convenience. It is the best option for those who need to use TipBet on their phones but are reluctant to download the app. For those who are worried about missing out any particular markets or feel that they won’t receive the same number of options, allow us to alleviate your worries as the TipBet mobile site too, has a variety of options. Designed for utility and ease of access, the TipBet mobile site is fast, responsive and reliable. Like the Sports section, the Casino section of the TipBet is a thing dreams are made of. Users can play a number of games such as Poker, Blackjack, Baccarat, Vegas Craps, Slots, Video Poker and so many others. Those who are looking for a slightly different experience will be delighted to hear that TipBet also has Live Casino through which you can play games such as Casino Royal, Blackjack, Roulette and others. Scratch cards and other games such as super bonus and bingo are also available. Your experience playing Casino through the app and the site will barely differ. With the same choices, bonuses, and promotions, you won’t have even the slightest of problems using either. The TipBet mobile casino lets you play games with stakes as high or as low as you want them. There is hardly any difference between the TipBet mobile app and the mobile site version. Both sites enable intuitive navigation, have several options, access to hundreds of special markets, and allow users to participate in live betting. The only minor difference is in terms of layout as, for obvious reasons, they have been designed with separate formats. You can choose either as per your needs, but we can assure you won’t regret choosing either one. Each of these has its advantages in terms of accessibility, usage, and navigation. The TipBet app is favored for its excellent mobile bonuses. Not only do these vary on the basis of section and game, but they also take into account the needs of the app users. Unlike most other betting apps, that only offer one or two bonuses, the TipBet app has several. Some of these include the Super Combi Bonus, a 100% welcome bonuses for Sports and Casino which depends on the amount of cash you deposit into your account. Obviously, the terms and conditions of each bonus vary, and you can find out more about these through the TipBet app or website. The app also offers users exclusive chances to bet on certain events for free, easily making TipBet the most generous betting app. Android is one of the most common operating systems in the world. If your phone has Android software, chances are you will be able to download the app without any issues. However, you do need to make sure that your smartphone has at least the 4.0 version of Android. If it’s functioning on an older version, now would be a good time to update your phone. Similarly, for iPhone and iPad devices, the oldest version of iOS that can support the app is iOS 7.0. Any version after this one is compatible with the TipBet App, while any version older than 7.0 won’t be able to support it. If you aren’t sure which version of Android or iOS your phone has, you needn’t worry. As some later models of phones and other devices come with the later versions of the operating systems, you won’t have to lift a finger. To make sure if your phone is compatible with the TipBet mobile app, see if your phone is either the model we’ve mentioned or a model manufactured after this one. A very well known app, TipBet was started in 1995. It gained popularity slowly and steadily over the next two decades and has since become one of the biggest names in the business. It caters to varied interests and users will find an astonishing number of options at their disposal. Virtual games and sports, Casino, Live Casino, Sports, Esports, all of these can now be found in one location. To top it all, TipBet is available in multiple countries and is available in several languages. With thousands of special markets, brilliant promotions, offers, and bonuses, TipBet is the ultimate gaming destination for betting enthusiasts. Keeping in mind the different needs of its customers, TipBet has started its very own mobile app. This mobile app can be downloaded on Android phone and iOS phones and can be used at any time from anywhere. The app comes with all the special features that are available on the TipBet website. Is the TipBet App safe? The TipBet App is very safe. It employs a number of methods to ensure that your account isn’t misused in any way. For example, after registering themselves, users are required to activate their accounts through a code sent to your email. Another great example of their safety features is that while withdrawing money, you will first be required to verify your account. What are the Casino/Live Casino options available on TipBet? There are multiple games available in the Casino and Live Casino. Some of these are Roulette, Black Jack, Baccarat, Poker and several other popular games. Does TipBet have bonuses other than the welcome bonus? Yes, TipBet has a variety of bonuses, cash backs and other promotions available. These can be found on the website as well as the app. Is it possible to bet live on the TipBet App? Yes, it is possible to bet live on the TipBet App. As the app gives users regular updates on matches that are going on in real time, the players have sufficient information to make bets. Live betting is among the TipBet app’s most popular features. Does the TipBet app have the cash out option? Yes, the app has the cash out option. Do I have to download the app to use TipBet on my phone? No, you don’t. TipBet also has a mobile version of the site, which allows users to access TipBet on their phones without downloading the app. While the site is a good option, even downloading the app has its own set of advantages. Do I have to make bank transfers to and from my TipBet account? No, you don’t. There are many payment methods such as Skrill, Neteller, and Ecopayz that you can use to deposit or withdraw funds from TipBet. You can find out more about this in our mobile payment methods section. However, bank transfer along with MasterCard and Visa are also among available options. Shortly put, the TipBet website and App are amazing. Despite the lack of live streaming, the app is one of the best betting apps available. TipBet makes up for the lack of this feature through everything else that it has. They have a beautiful layout and outstanding features, which make playing on the app a pleasure. What adds to this experience is the number of markets that can be used by players. Another major point in TipBet’s favour is their bonuses. Most betting apps have very few offers and bonuses, but TipBet is far more generous than these. The safety features of the TipBet app and website are extremely reassuring. 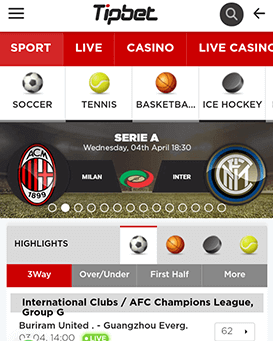 We definitely recommend this app to users who are unable to choose between betting apps. As for our final verdict, we believe that the TipBet app deserves a 9 out of 10.